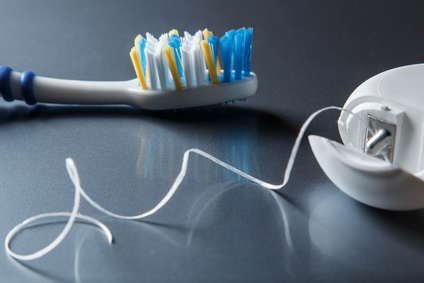 Brushing and flossing: which comes first? Have you ever wondered if you should floss before you brush your teeth? As children, we are usually taught that brushing your teeth comes before flossing. This is one of the reasons why many people don’t floss. After brushing your mouth feels clean, and when your mouth feels clean, flossing feels like an option, not a requirement. A recent study found that flossing your teeth before brushing them loosens bacteria and allows your toothbrush to remove plaque easier. In the study, it was demonstrated that those who flossed before they brushed their teeth ended up with less plaque on their teeth in comparison to those who brushed and then flossed. Flossing your teeth before brushing also has the added benefit of keeping more fluoride in your mouth after you’ve finished brushing. Fluoride is a natural mineral that protects teeth against decay and reduces the levels of acid produced by bacteria on your teeth. Using toothpaste with fluoride is an essential part of good oral health but it is not all that is needed. Taking care of your mouth is about more than having a beautiful smile. Looking after our oral health with brushing, flossing, and keeping our diet low in sugar cannot be overstated. Compromised oral health is connected to a range of physical health outcomes such as high blood pressure, heart disease, and diabetes. There are some studies that suggest improving your oral health also improve your overall physical health. Another important part of good oral health is regular dental visits. Call today and make an appointment to get your teeth checked, or fill out our contact form and click send.